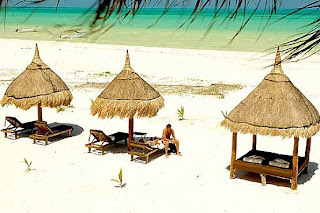 Casa Sandra in Holbox, Mexico: this is an island off of the Yucatan, about a 2 hour drive from the Cancun airport, and then a short ferry ride. It's supposed to be so great--not overly touristy like Isla Mujeres or Cozumel. We wrote about it in Cookie, and both the writer and the photographer, who weren't there together, said they loved it. Clara's former preschool teacher also went there, and loved it. Very laid back, lots of nature, and lots of sun. Small Hope Bay Lodge on Andros Island in the Bahamas: Another place we wrote about in Cookie, that my husband loved, and another editor at the magazine liked so much, she went twice. I see from their website that they have a package for a beachfront 2 bedroom all inclusive that is $3550 in high season for 5 nights/six days. Morgan's Rock in Nicaragua: This is a spot that a writer had pitched to me, and she had gone there with her family, and loved it. It's an eco-lodge right on the sea, that has its own farm, so most of what you are served is super fresh, and the fish is what is caught that day. It works out, in high season, to be about $700 night all inclusive (even includes local beer), with adults being $196 per day, and kids being $136 per day. 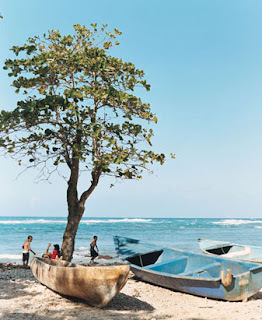 La Catalina in the Dominican Republic: We came to this very sweet hotel with Cynthia Rowley, last spring, and loved it. It's about an hour and a half drive from the Punta Cana airport, and you just arrange to have the hotel pick you up (the taxi service is so cheap, but you have to be prepared that no one has car seats or boosters). The staff is so warm, the rooms are very comfortable (not luxe, but everything you need), there are two pools, and it has a great view to the sea. To go to the beach, you do have to get in a car. You can either get a taxi, or you can have the hotel arrange a rental car for you. Read the article we wrote in Cookie to know more about it (the website is still up! )...The rooms are in the $100 night range, and the food is so good, and so cheap. You kind of can't believe that it can be so good, and that cheap. I would love to go to the tropics for spring vacation. I am quite excited for my trip this year.